We designed this tea to help keep you looking good! If you are not there yet, then it will definitely help get you there. Silk oolong tea leaves are full of antioxidants that remove harmful free radicals from the body helping to slow cell and tissue damage. It also contains vital vitamins and minerals such as calcium, manganese, copper, carotin, selenium, potassium, and vitamin A, B, C, E, and vitamin K. Additionally, it contains folic acid, niacinamide, and other detoxifying alkaloids. Polyphenols (a type of antioxidant) are great for supporting fat loss as they boost the metabolism and help to block fat building enzymes. Not just in our tea as a flavor enhancer, strawberries are also packed with polyphenols. Garcinia cambogia contains an acid called hydroxycitric acid or HCA that also supports weight loss. First, it suppresses your appetite by increasing your serotonin levels, which reduced stress and improves mood. Second, HCA helps stop your body from creating fat by blocking an enzyme citrate lyase that your body needs to turn those extra carbs into fat stores. Guava leaf has a myriad of health benefits, especially with regards to the liver as it helps prevent your liver from turning complex carbohydrates into simple sugars get stored as fat. It also helps to prevent the buildup of fatty deposits in the liver via expression of adiponectin receptors. In an article published Nutrition and Metabolism, study participants who drank guava leaf tea had lower cholesterol levels after eight weeks. Japan has approved guava leaf tea as one of the foods for specified health uses to help with the prevention and treatment of diabetes. 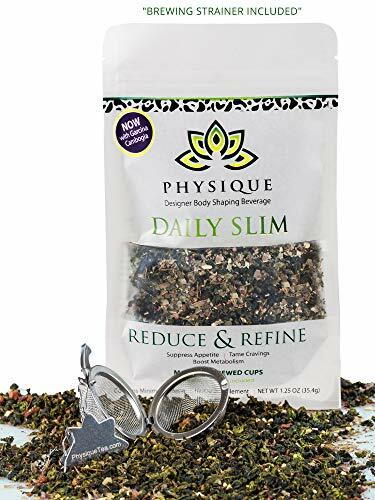 The compounds in the tea help regulate blood sugar levels after meals, by inhibiting the absorption of two types of sugars - sucrose and maltose, thus promoting rapid weight loss. If you have any questions about this product by Physique, contact us by completing and submitting the form below. If you are looking for a specif part number, please include it with your message.